The directors of the Columbian Exposition wanted to outdo the 1889 Paris World’s Fair. The hit of that fair had been Gustave Eiffel’s soaring iron tower. 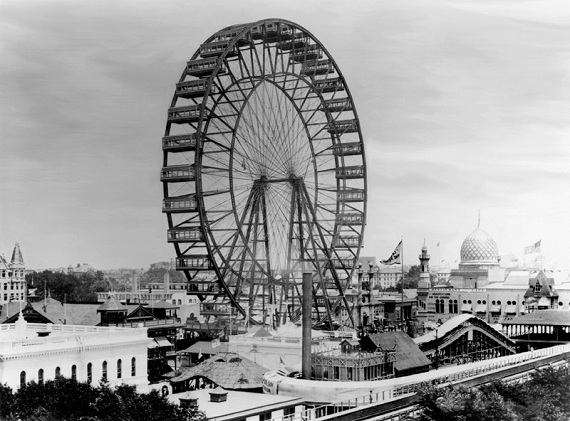 On June 21st in 1893, the world saw Chicago’s answer to the challenge: George Washington Ferris’s giant wheel. Ferris was a young Pittsburgh engineer. He’d gotten his idea from that new fad, the bicycle. With boyish enthusiasm, he convinced investors to spend $400,000 (about $10 million in 2012 money) so he could build a 300-foot-high, spinning bicycle wheel. So now, a month into the Exposition, it was ready. At four in the afternoon, a crowd of 2,000 people gathered at the base of the wheel. Overhead, in one of the 36 cars – which were more like sheds, and could each hold 60 passengers – a brass band pumped out patriotic tunes. Red, white and blue bunting was everywhere. The speeches began. They followed the theme that American ingenuity had once again triumphed. One of the speakers, General Nelson Miles, said that Mr. Ferris’s wheel had surpassed the Seven Wonders of the World. Finally, the man of the hour spoke. He thanked all those who’d been involved in the project. He especially thanked his wife Margaret for her unwavering support. Then Mrs. Ferris stepped forward and handed her husband a golden whistle. He blew it once. On that signal, the giant wheel began to slowly turn. The crowd applauded. Then, in good order, they lined up for a ride. A trip on the 1893 wheel consisted of two revolutions. The first time around, six stops were made to load the cars. After that, the riders got a second, non-stop spin. The whole ride lasted about 20 minutes. The cost was ¢.50. The public loved the big wheel. On a clear day, you could see Wisconsin, or all the way across the lake to the Michigan shore. By the time the Exposition closed in October, nearly 1.5 million paid admissions had been rung up. There was not a single accident or injury. George Washington Ferris was hailed as a modern Da Vinci, but he did not enjoy his fame for long. 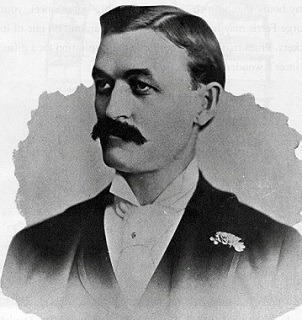 He died of typhoid in 1896, only 37 years old. The original Ferris Wheel played a number of engagements in later years. The novelty gradually wore off, and it was blown up in St. Louis in 1906.